The latest member of Microsoft’s Office suite, Microsoft Delve, has begun rolling out to business, government, and education customers, bringing Microsoft’s relationship-building tool to your Office 365 workplace within the next few months. At its Convergence conference this week, Microsoft tipped the first capabilities of Office 2016, with a nod toward the business customers that the conference is addressing. Microsoft also said that it is previewing Skype for Business (formerly called Lync) as well as providing its PowerBI preview to customers worldwide. Delve happens to be the one of the latest tools in what might be called Microsoft’s mashup generation: like Office Mix and Sway, the app pulls in data from Outlook, Yammer, PowerPoint, and Bing, collecting the documents, relationships, and information that it thinks might be most relevant. It’s predicated on what Microsoft calls the Office Graph, Microsoft’s maps of the actions and interactions you take within Office 365. Microsoft says it has mapped 6 billion of those actions to date, pulling in data from SharePoint, Office 365’s video content, and now email attachments. Microsoft said that Delve would be rolled out beginning today to those customers who subscribe to the Office 365 Enterprise E1–E4 subscription plans, including the corresponding A2–A4 and G1–G4 plans for academic and government customers. 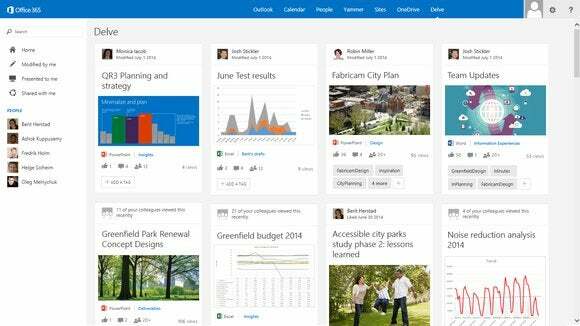 Delve will also be included in the Office 365 Business Essentials and Business Premium plans over the next couple of months, Microsoft said. Microsoft also announced that it has now rolled out the technical preview of PowerBI for Excel around the world, following its launch a year ago. PowerBI is designed to be a tool for non-techies to access technical data, quickly composing their own sales reports through natural-language queries against robust data sources—typing in a query like “what was our most popular product in Brazil last year?” should deliver a graph or even a map of those results. Incorporating Google Analytics, Microsoft Dynamics Marketing, Acumatica, Zuora and Twilio will come soon, Microsoft said. 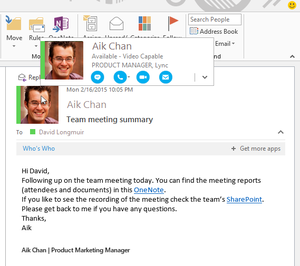 Skype for Business is now directly integrated into Office. Microsoft also said that it had begun making available a preview of Skype for Business, the service that was formerly named Lync. Skype is now integrated directly into Office, so you’ll have the option to video chat with a contact, for example, as well as email her. The final version of the new client, server and online service will become generally available starting in April, Microsoft added. Most existing software and hardware solutions that are qualified for Lync 2013 will also be compatible with Skype for Business, Microsoft said. Why this matters: Microsoft Office still represents one of the pillars of Microsoft’s success, and the company has been criticized before for letting it go stagnant. Refreshing Office and adding new capabilities is one way of keeping Office vibrant and in the front of the minds of IT managers—who Microsoft wants to persuade to keep signing up for Office 365 subscriptions. We haven’t had a chance to try out Delve ourselves. But since it’s free, we’re hoping that it turns out to be a useful tool.